St. Mary's is introducing small faith sharing groups that are centered and coordinated at the parish level. The pastoral associate, in collaboration with the pastor, crafts a message of the week based on the gospel and homily of the previous Sunday. That message is then distributed to every group of 6-10 folks who gather each week to go deeper into the Gospel message. 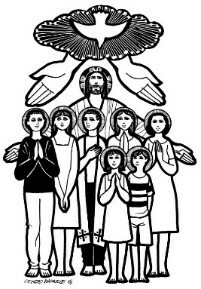 These groups provide parishioners an opportunity to grow closer on a personal level at the same time feel a greater sense of connection to the whole parish family. It is a time and place to explore how the gospel message is relevant to your life with others who are devoted to the same endeavor. Every group has a dedicated facilitator who is there help create a space where everyone feels welcomed, included and supported. For questions and to contact our Small Groups Ministry click here. For our Weekly Small Group Reflection click here.